I had often read and heard from serious birders that wild birds can be trained or teased into eating from your hand. But until this week I had never experienced it. One morning when I saw that my feeder (see below) was empty I thought that perhaps I'd try, so I put some food in my hand and maneuvered my arm outside my open window so that my hand would be right up against the feeder. Then I just stayed that way for about 5 minutes, very still and waiting. The birds saw the food and started flying up to it, but veered quickly away when they saw where it was. After 5 minutes I quit and resumed getting ready to go to work. The next day I tried again. And again, there was a lot of flying and swooping and even noises, but no landings. 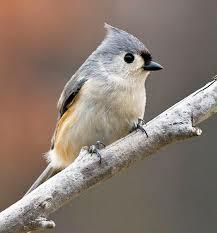 Day three: same procedure, same result, until a little tufted titmouse (see below) bravely landed on the feeder and then jumped down to my hand. 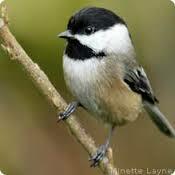 After flying off with a seed, didn't a little chickadee (see below) follow suit. The landings were so soft, the birds so light in weight, and the picking up of the seeds so delicate, with the take offs so quick, I almost had a heart attack from the experience. I couldn't believe it had happened, wild birds feeding from my palm. WOW, WOW, WOW.